Nordic Approach is a sourcing company focusing solely on high quality green coffees. We do the groundwork to identify, improve, select, and import the best coffees from the most interesting origins. We sell to roasters all over the world, from our warehouse in the UK for the EU/Asian market / Russian market, and warehouse in the United States for our North American market. We have a great range of fresh seasonal coffees coming in throughout the year. We offer purchase planning to help roasters work our their seasonal product range and buying plans throughout the year. Travel with us to origin to cup and visit farmers & producers, and pre-book your favourite coffees from your favourite producers in advance. Every coffee we buy or forward to a client is selected based on the cup profile. We believe transparency through the chain and premiums going back to the producers is the only way to achieve a sustainable quality coffee production. We provide detailed info on all products on cropster hub as well as price transparency throughout the supply chain. We guarantee against quality drop prior to coffee arrival. We will always stand behind the quality offered and take responsibility for any unexpected problems.We can efficiently work out delivery to your roastery or warehouse, and provide assistance on documents etc. We can also source great quality coffees for clients that are able to import coffees themselves directly from origin (FOB), see our sister company Tropiq for more info. Working long-term with cooperatives, associations, and farmers enables us to do increased lot separation and more selective buying. Through the premiums we pay every year, the farmers are able to invest and fine-tune quality, and we are able to access increasingly good coffee year after year. Our goal is to be able to share this relationship with our clients. We want to be a preferred supplier and sourcing partner for any roaster looking for exceptional quality, and we will do what it takes to fully control the supply chain and secure quality coffees for our clients. We are also focused on adding value through transparency and extensive information about each coffee we offer, and developing projects in origin. By mainly working in specific countries in East Africa and Central and South America, we aim to be the best in our segment. We are investing time and attention to specific countries with great potential for amazing coffees. This means we will have a specific selection of origins and a great variety of coffees from every country where we work, instead of sourcing bits and pieces from wherever coffee can grow. 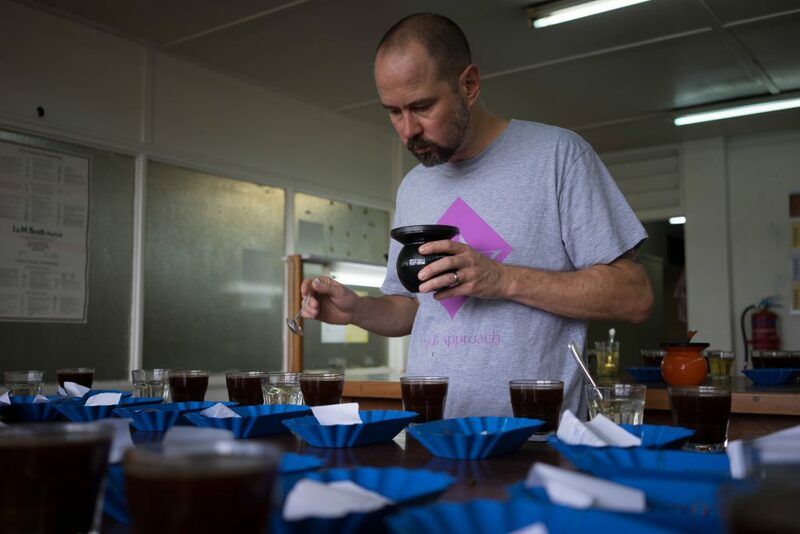 Morten cupping at RTC in Kigali, Rwanda. Offered on our spot/offer list from our UK warehouse. We have a great range of seasonal coffees coming in throughout the year. For roasters to work out their seasonal product range and buying plans through the year together with us! See here for more info. Pre-book your favorite coffees and/or producer specific products in advance. Travel with us to visit the growers and producers. Cup coffee with us at origin. Detailed info on all products as well as price transparency throughout the supply chain. We can efficiently work out delivery to your roastery or warehouse, and provide assistance on documents etc. We can source great quality coffees under our same criteria for clients that are able to import coffees themselves directly from origin. We guarantee against quality drop prior to coffee arrival. We will always stand behind the quality offered and take responsibility for any unexpected problems.